Right after I finished grad school, I worked on a research project that studied how New Orleans was recovering from Hurricane Katrina. Though I spent most of the summer working from my home in San Francisco, I did get to spent two weeks that August in New Orleans, enough time to do some exploring and get a sort of sense for the city. My hotel was located adjacent to the French Quarter, and while I had a few friends who I met up with for brunch or drinks, I had a lot of time on my own, especially in the evenings. So I did what I usually do when I hit a new city, and on my first evening there I Yelped the closest highly rated cocktail bar and wandered over early in the evening, before I knew the big crowds would arrive. I struck up a conversation with the bartender, who was friendly and eager to talk. I gave him free reign to make me something interesting, and asked questions about some of the more obscure looking bottles on his shelf. I told him that I was in town for two weeks and had a lot of free time, and asked for some recommendations for great cocktail bars I had to check out. He pulled out a cocktail napkin and scribbled down a list of about ten bars, as well as the names of his friends who worked at each bar. “Ask for them, and tell them Chris sent you,” he said. Over the next two weeks, I had what I can only describe as a whirlwind cocktail tour of New Orleans, tasting incredible cocktails, interesting and obscure liqueurs, and aged spirits produced from dusty back rooms that the bartender had been saving for some festive evening. Turns out Chris, my friendly first bartender, was quite well-known and beloved in the tight-knit cocktail community there, and saying his name was like some magical key, unlocking warm and friendly conversation, excited and enthusiastic tastings, and plenty of bar tabs that were waved away with a dismissive hand when I tried to pay. In those two weeks, traipsing throughout that hot and sultry gothic city, I learned more about Southern hospitality, community, and authentic and enthusiastic commitment to the craft of the cocktail than I think most people do in a lifetime. Most importantly, I learned about Herbsaint, New Orleans’ wormwood-free answer to absinthe, and the crucial ingredient in the Sazerac, the official cocktail of New Orleans. 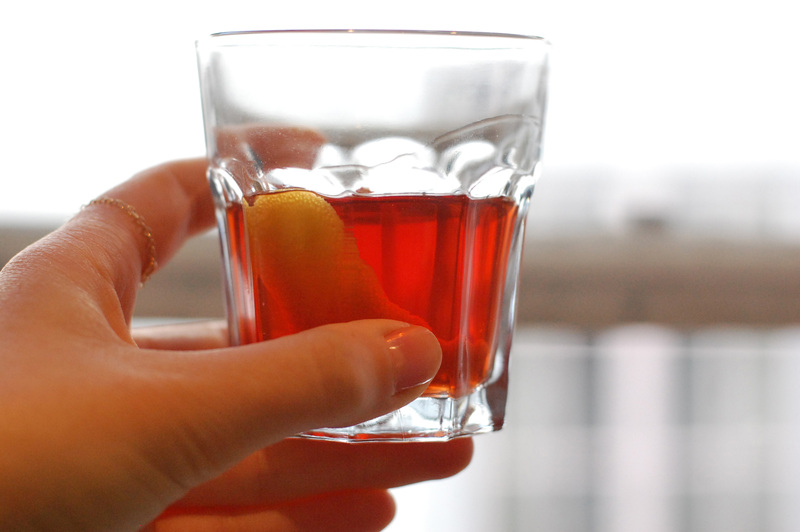 I had many Sazeracs while I was there, as every bar has its own variation, and I’ve had many since I’ve left. While I know my taste buds’ memory have likely failed me, and the way I drink my Sazeracs now probably isn’t how I drank them that summer when they became seared into my brain, this is what tastes just right to me. I go heavy on the Peychaud’s and add in some angostura for good measure, and use Herbsaint instead of absinthe, always. In a mixing glass, drop in the sugar cube and cover with the bitters. Add a tiny splash of water to the mix. Muddle the sugar cube until it’s broken down, then add rye and ice. Stir until everything’s nice and chilled. In the meantime, coat an old fashioned glass with the Herbsaint by pouring it in the bottom and rolling it up and around the sides of the glass. Shake out excess. Strain the contents of the mixing glass into your glass, then squeeze the lemon peel over the top and rub it around the rim. Sip and be transported to the French Quarter, sitting on a wrought iron balcony, watching the gas lamps be lit as a parade boisterously makes its way down the cobblestone street. I know this is an older post, but I had to share. Went to make a negroni and saw that I was out of key ingredients. So I started making an old fashioned-y sort of thing with Rye, cointreau and bitters. Meh. Then I remembered I had some absinthe and you had a sazerac recipe. I dumped my drink into pint glass, rinsed the tumbler with absinthe (I confess I didn’t have the heart to shake the rest out), then poured the made drink back into the tumblr. Oh boy!